My sweet cousin Angela (known to most as "Angie") passed away yesterday in a car accident. She is just a year and a half older than me and also a mother of three children. I can still remember when she and her husband Robert first met and he wooed her by taking her to Phantom of the Opera. They were a match made in heaven. Please keep her family in your hearts and prayers. 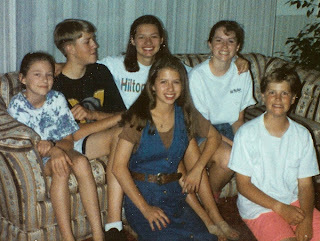 I went through my photo albums yesterday and found this fun picture of my sisters and I with our cousins Angie (far right on the couch), Lowell & Andrew. My favorite thing about Angie was her infectious smile. Oh, that is so sad. I'm so sorry for her family. We will keep them in our prayers.